When you want to pick the right caterer, there are almost countless options. From the well-established, elegant and timeless, to the new, fresh and creative caterers, there is the right caterer out there for you and your function. However, with all of these choices, how can you be prepared to decide on one? The Heights in Verona is here to help guide you through the initial steps to help you along. What type of event is this? Business or a more personal type of event? What kind of food will you serve? And do you want an in-house culinary staff? Regardless if this is a business meeting, baby shower, birthday or retirement party, or any other type of event, what’s the theme? Do you want to work with an experienced event planner? What kind of budget do you want to set for this event? It may be a lot, but knowing these basic aspects of your event will help narrow down the candidates immensely. After you have the basis of what you want in place, you can better whittle down the number of caterers competing for your dollar. So, what else can help you pick the right caterer? There’s no better source than someone who’s previously used a caterer’s services. Ask around. Does anyone you know in your business or circle of friends have any recommendations? If you’re planning a business luncheon, see if any other departments in your organization have used a local caterer before, and see what their experiences were. Also, seek online reviews at such sites as yelp.com. If you’re looking for a venue to fit your needs, make a visit to the venue a part of your selection process. A creative event that’s customized to your organization or your event can put a nice personal touch on your event. Also, make sure you will have enough room for all guests, as well as ample parking to make sure your guests’ experience better. The Heights in Verona can accommodate up to 550 guests, and will work with you to bring you the ultimate customizable experience. You can use all 7,000 square feet to fit your needs. Or, for more intimate gatherings, we can accommodate much smaller events as well. Whether you’re looking for a venue to hold your event, or you’re looking for someone to provide a meal for your event, make sure the food is up to your standard, and that it will fit with the theme of your event. Make sure you judge not only on taste, but also on presentation to maximize that “wow” factor for your guests. At The Heights, we pride ourselves on our wide menu and locally-renowned culinary staff. Our event planners can work with you to develop a menu that meets yours and your guests’ tastes. Are you looking for a buffet-style meal that offers a wide variety of choices to your guests? Or would you prefer a more formal, plated meal, served by our professional and elegant service staff? 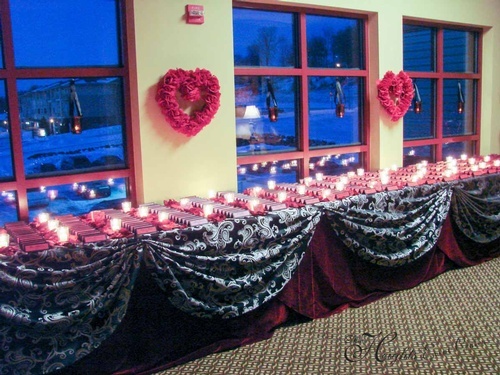 Whatever the theme and atmosphere of your event, The Heights in Verona can match it. From chairs and tables to linens, you may not have all that it takes to adequately seat and entertain all guests. Make sure that you plan for everything that you’ll need – right down to the decorations. You don’t want to be caught without a crucial part of your event the day of. So, you’ve worked out a budget, so now you want to stick to it, right? With any caterer, the sky’s usually the limit, but you don’t want that to be what you shoot for, from a financial standpoint. A quote will be able to give you a good idea of what you will get for what you want to spend. A good caterer will also want to work with you to stay within that budget, and making the most of any budget you have in mind. Luckily, The Heights in Verona has in-house event planners that are experienced at working with in any budget.